What makes a movie a must see? Is it the genre, the actors, or the talent behind the screen? For me, it all comes down to a fascinating story. Right from the get-go, a superb movie can make you see and feel things from so many different points of view. Movies have the power to share life experiences, dreams and aspirations and so much more. Pair that with an exceptional trailer that will pique anyone’s curiosity and you have the ability to showcase something truly special. The new documentary Three Identical Strangers is definitely something special. Three Identical Strangers draws you in, in such a way that it makes you question what is really going on behind the compelling story of a family once lost. This amazing story proves that sometimes life is stranger than fiction. You know what they say two heads are better than one, now what about three? Imagine waking up one morning and realizing you had an identical brother that you never met. That would be quite the shocker, now imagine finding out you are a triplet and you never knew it. All three of you look the same, act the same, and even like the same kind of food. Now that’s crazy! 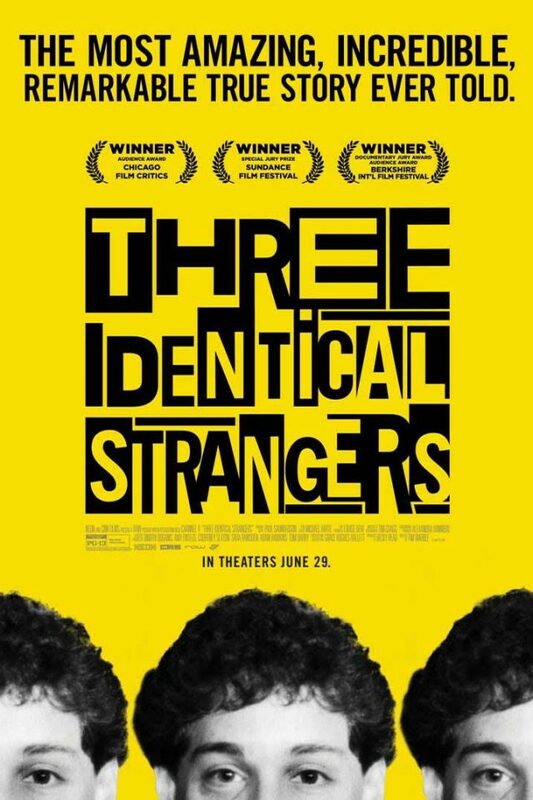 Three Identical Strangers is the remarkable true story of identical triplets that are separated at birth and adopted by three different families. 19 years later, their amazing reunion has become somewhat a global phenomenon. The more than charming trio become familiar with both their unique situation and each other. The more they unearth they discover an unimaginable dark secret that has radical repercussions for both them and the ones they love. Don’t let this incredible documentary fly under your radar. I highly recommend it!